A Pool Party Is Not Complete Without a Saltie ……. 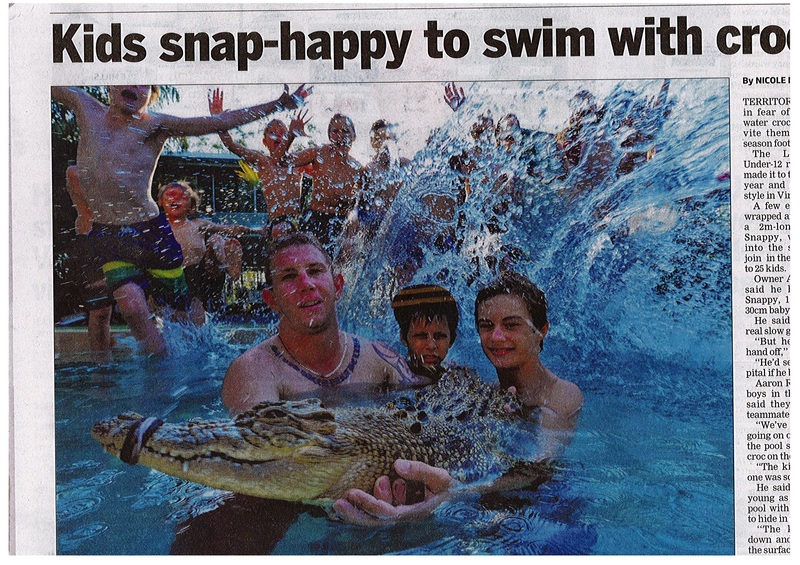 In true Territory style , the under 12 Litchfeild Bears Rugby team celebrated the fact they have made it to the semi finals this year with a pool party – and among the guests was a 11-year-old 2 meter long saltwater croc called Snappy. The kids had the time of their lives swimming with a real live croc who had his snout safely shut with rubber bands . Poor Snappy tried to hide in the deep end ( he must love under 12 rugby teams about as much as I do ..) but the kids were not going to let him get away easily , diving down and pushing the pissed off croc back up to the surface . According to one of the parents , the kids “loved it , everyone had big smiles on”…. well except Snappy who probably would have been smiling if those rubber bands slipped off his snout ! !